Magic | Roger Cummiskey - ArtRoger. In all truth, one shouldn’t write or say anything about art of such supremacy that it reveals itself when contemplated in silence and which, via this silent consideration, opens a door to a new perceptional consciousness. Ultimately, one would not write or say anything were it common in Europe, when looking at art, to give the virtue of silence preference to loquacious eloquence. But when we are confronted by art, we are used to accepting it as a complex construct and to analyzing it, to determining its advantages and disadvantages, and to evaluating it from different perspectives. And not only contemporary art often raises the disquieting question regarding what the artist wants to say to us. Other Art Brownies by Roger at galleryG, Toronto. This year’s theme is loosely based on MAGIC. We have received many submissions as well as invited several artists to work around the theme. Summertime, when all things grow enthusiastically it is also the perfect time to enjoy and celebrate the diversity of artistic expressions. 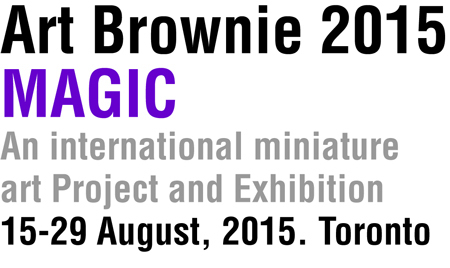 Initiated and organized by INDEXG in 2011, this season will reveal a new collection of brilliant art brownie works. Come and see for yourselves! Adam Chow, Alice Chick, Andre Kan, Andrea Howson, Anna Tai, Bato Bazarov, Dante Kirkman, Diane Lingenfelter, Donna Carr, Dora Grinnell, Edwin Kwan, Elaine Munro, Elizabeth Wagner, Emily May Rose, Fiona Legg, Gary Smith, Gina Groot, Hana Lang, Irina Schestakowich, Ivan Zhao, James Taylor, Jana Charl, Janet Potter, Jennie Philpott, Jennifer Black, John Powell, John-Michael Korpal, Juile Burdett, Kai Chan, Katharine Miller, Kay Gregg, Kelly Hu, Kiyomi Burgin, Kristen Kong, Leslie Mathie, Linda Black, Lenore Ramirez, Marina Hanacek, Marta Koloszyc, Mary Paz Sobreira, Me Hoi, Melissa Johns, Mina Hedayat, Myrna Brooks Bercovitch, Patrice Baker, Peter Bullock, Rachel Heinold, Rob Niezen, Roger Cummiskey, Sandi Wong, Shelley Savor, Sherrie Penn, Stella Leung, Stephanie Chambers, Taras Ostapchuk, Taryn Gee, Tomio Nitto, Valerie Powell, Vik Lai, Yoshi Inouye. To cerebrate the event, please send this link to your friends, post it on your social media pages as well as your website. Please note that once you enter the site, you will see a random display of 15 images from the exhibition. The display of artwork rotates every time you enter the site or refresh the page. You can see the full list of artists by clicking “Participating Artists”. Find your name from the list and check if your web site is linked correctly. Artemisa, Mijas Pueblo, Malaga, Spain. Lupita Designs, Fuengirola, Malaga, Spain. The Golfer Marbella, Malaga, Spain.